The H-1 engine traced its ancestry to postwar American development of rocket propulsion systems, and the opening section of chapter 4 includes an assessment of this engine's technological heritage. While the development of other engines discussed in Part Three differed in specifics, the overall trends in their design, test, and achievement of operational status paralleled that of the H-1 and sprang from the same evolving technology. Introduced on the Saturn V, the giant F-1 engine, while more akin to the conventional cryogenics of the H-1, experienced many development problems. The problem of scale affected many aspects of Saturn hardware development, as the F-1 story attests. Application of liquid hydrogen (LH2) technology constituted one of the key aspects of Apollo-Saturn's success. The upper stages of the Saturn I and Saturn IB introduced LH2-fueled RL-10 and J-2 engines, respectively, as discussed in chapter 5. Development of rocket engines was usually conducted several steps ahead of the stage's tankage and the stage itself. This was done because of the inherent complexities of propulsion systems and inherent difficulties in engine research and development. Moreover, the choice of engine propellants influenced many elements of stage design, including the location of fuel and oxidizer tanks, propellant lines, and the various subsystems involved in the interface between the engine and stage. Much of the ultimate success of the Saturn launch vehicles depended on the application of cryogenic technology-the use of liquefied gases in propellant combinations. The first-stage engines of the Saturn I, Saturn IB, and Saturn V (respectively, the S-I, S-IB, and S-IC stages) used a noncryogenic fuel called RP-1, derived from kerosene. All Saturn's engines used liquid oxygen as the oxidizer, and the engines of the S-IV, S-IVB, and S-II stages relied on liquid hydrogen as fuel. Put simply, the ability to carry large amounts of cryogenic propellants meant much more efficient launch vehicles. If designers had tried to build a rocket large enough to carry gaseous propellants, the size and weight of the tanks would have made it impossible to construct and launch such a vehicle. With the gaseous propellants converted to a liquid state, requiring less volume, designers had the opportunity to come up with a design capable of getting off the ground. In the 1960s, cryogenic technology experienced a phenomenal rate of growth and state of development. In support of the space effort, scientists and engineers accomplished a number of major breakthroughs, not only in the field of cryogenics itself, but also in the design and production of cryogenic rocket engines. In the early post-World War-II era, as the United States' military services struggled to develop their own stable of launch vehicles, they leaned very heavily on the German wartime experience in technical areas  beyond the basic design of vehicles and rocket engines. Although a reasonable amount of cryogenic technology was available in the United States by World War II, there was little experience in applying it to rocketry. Goddard's work in cryogenics was apparently overlooked or inappropriate to the scale demanded by the ICBM program. A review of engine advances achieved by the mid-1960s can effectively characterize the accomplishments leading up to the Saturn and highlight the innovations that were actually incorporated into the Saturn propulsion systems. Problem areas, which limited the desired performance of these engines, received special attention from a wide variety of research programs. Many improvements stemmed from the research programs carried out by industry. Many more evolved from the cooperative efforts generated by NASA and the various military services. The primary technological advances can be summarized under the following categories: thrust chambers, turbopumps, and system design and packaging. Many early liquid-propellant engines featured a conical nozzle. Engineering improvements in thrust chambers were aimed at more efficient shapes for increased performance and decrease in weight. Designers sought higher performance through higher area-ratio shapes with higher chamber pressures to minimize the size and weight of the thrust chamber. In the drive to produce large, high-pressure engines, a major hurdle was a satisfactory means to cool the thrust chamber. 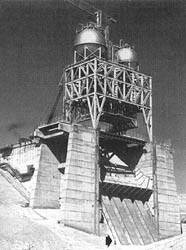 An early solution used double-wall construction; cold fuel passed through this space en route to the combustion chamber, thereby reducing the temperature of the inner chamber wall. But design limitations restricted coolant velocity in the critically hot throat area of the engine. Thin-walled tubes promised an ideal solution for the problem of the thrust chamber walls. Tubes reduced wall thickness and thermal resistance and, more importantly, increased the coolant velocity in the throat section to carry off the increased heat flux there. As chamber pressures continued to go up along with higher temperatures, designers introduced a variable cross section within the tube. This configuration allowed the tube bundle to be fabricated to the desired thrust chamber contour, but variations in the tube's cross section (and coolant velocity) matched the heat transfer at various points along the tube. The bell-shaped nozzle permitted additional  advantages in reducing size and weight when compared with what engineers called the "standard 15-degree half-angle conical nozzle." Without any reduction in performance, the bell shape also permitted a 20 percent reduction in length. Advances in one area of the propulsion system created demands on other parts of the system. As thrust levels and pressures increased, so did demands on the turbomachinery to supply propellants at greater flow rates and higher pressures. Problems concerned the development of higher powered turbomachinery without increases in size or weight. Advances in turbomachinery design centered on higher speeds, and the goal of higher speeds encouraged the introduction of rotating components with smaller diameters. Essential subsidiary improvements dealt with high-speed bearings, the performance of high-speed inducers, and higher speeds for the impeller tips. Engineers succeeded in increasing the operating speed of bearings through minute attention to details of the operating environment and the fabrication of bearing parts. Designers reconsidered and redesigned bearings for their optimum size, the contact angle of surfaces touching the bearing, and the curvature of the race structure. Better performance was gained by engineering the newly designed bearings for combating contact fatigue and wear from overheating. Further refinements included the introduction of new, high-strength materials and improved surface finishes in the fabrication of precision parts. The innovative use of the engine's own propellants as "lubricants" was another advance. Although the propellants were not lubricants in the usual sense, they served the same purpose. The properties of the propellant-lubricants were more important in carrying off frictional heat to keep pump bearings cool and operable. This application simplified turbopump operation and eliminated the need for externally supplied lubrication. Engine designers also attacked propellant cavitation, a condition in which the formation and collapse of bubbles or vapor pockets while pumping the propellant caused vibrations and damage to rocket machinery. Study programs found how the cavitation characteristics were related to the inducer through such minute factors as the angle of blades, taper, blade sweep, and the profile of the leading edge. More accurate theories on the phenomenon of cavitation enabled a redesign of the inducers that doubled their suction. The overall increase in suction efficiency of the turbopump permitted the pump to operate at higher speeds. This contributed to weight savings in the vehicle because tank pressures-and tank weight-could be lowered. The higher operating speeds and pressures triggered development of pump impellers to  operate with higher tip speeds. The infusion of high-strength materials, plus design improvements and fabrication techniques paid off in reliability and greater speed. In total, all of these developments enhanced the incremental gains in power-to-weight ratios. This cutaway drawing of the turbopump for the H-1 engine shows the back-to-back arrangement of oxidizer pump (at left end) and fuel pump (at right end) operating off a common turbine and gear box (center). The propeller-like inducer blades can be seen on the left end of the shaft. In many ways, the H-1 was a composite example of rocket engine development in the 1950s, modified and improved for its role in manned launches of the Saturn I and Saturn Ib. Even though the H-1 was derived from a propulsion system already in production (the S-3D engine for the Thor and Jupiter), requirements for increased thrust and generally improved performance led designers and engineers into new and frustrating problems. The evolution of both the H-1 and the F-1 engines fell into the pattern of many launch vehicle development programs, in which the engines constituted the pacing item.8 Furthermore, the difficulties in engine design were usually predictable, as Leonard C. Bostwick, a veteran MSFC engine manager, knew all too well. "The development of liquid rocket engines followed similar patterns regardless of engine size," he asserted. Despite this ability of the engine managers to look with a crystal ball into the future, ability to avoid all expected pitfalls did not follow. "In the development of liquid rocket engines, problems occur at several distinct intervals," Bostwick continued. "The type of problem and the time phase can be predicted, but since the exact nature of the problem cannot be so readily defined, a five to seven year development program becomes a necessity. "9 In general, an engine development program progressed through four distinct problem phases" over the five- to seven-year period. The designers of each successive generation of rocket engines commenced their work with facts and figures accumulated-often painfully-from earlier designs and experience. If, however, the new engine was expected to perform better than the old ones, the designers very quickly found themselves in uncharted territory. They proceeded to push ahead of the state of the art, seeking more flexibility in operations, greater simplicity, increased thrust, and improved overall performance. At this point, Bostwick pointed out, "The first problem phase occurs because of the inability to totally extrapolate and build on existing knowledge." Just as problems were predictable, so were the problem areas. Bostwick was specific: "The problems will occur in the combustion mechanics, propellant movement, or in the propellant control system." The hardware evolved for this early development period often proved to be less than adequate, and faults would sometimes not show up until the engines moved past the initial firing sequence tests, perhaps in the late tests to maximum projected duration and thrust levels. When the  problems then showed up, they were "often catastrophic," Bostwick wryly observed. For this reason, the engines were subject to extensive test programs to expose their inherent frailties. Some time after the engine had successfully passed qualification tests of the basic engine design, or even the preflight rating trials, the second cycle of problems appeared. The difficulties involved the mating of the propulsion systems to the vehicle or stage. Because the development of the engines usually preceded the development of the stage by two or three years, the engines would not fit the mounting hardware and multitudinous connections with the stage. In addition, there were the peculiarities of late changes in the stage-engine interface requirements or possibly in the operational environment introduced by new variations in the flight plans. The stage contractors received prototypes or preflight-rated engines and cooperated with the engine interface. Inevitably, new sets of variables, which could not be anticipated from mating with a nonexistent stage or for changes in mission requirements, created problems. As the engines phased out of the developmental stage and into full production, MSFC personnel and the manufacturer turned their attention to the third round of problems. They watched the elements of quality control, tolerances in the manufacturing of components, vendor selection, choice of manufacturing materials, and definition of the integral manufacturing process. "A continuing development program is planned during the period," Bostwick explained, "to provide the trained personnel, facilities and hardware capabilities to investigate these problems and to prove out the required corrective effort. Defying all these attempts to identify potential failures, to uncover and correct weaknesses before a multimillion-dollar vehicle left the launch pad, actual missions inevitably uncovered a fourth set of problems, because there was no way to duplicate the actual environment in which the vehicle had to perform. With launch dates carefully scheduled ahead of time to coincide with the launch "windows" and carefully paced to the requirements of the Apollo-Saturn program, the problems uncovered by one mission demanded a very fast response to keep the next phase of the program on schedule. For this reason, NASA and the contractors maintained a well-staffed cadre of specialists at the contractors' engineering and test facilities, backed up by the facilities available at MSFC. Despite the best intentions of all concerned, engine development and production encountered predicaments throughout the duration of the Saturn program. The models of the H-1 used in the Saturn I and Saturn IB shared the same seven major systems: thrust chamber and gimbal assembly, exhaust system, gas generator and control system, propellant feed system, turbopump, fuel additive blender unit, and electrical system. Production of the H-1 propulsion system involved several design aspects unique to the Saturn program. For example, the Saturn H-1 engine came out of Rocketdyne's shops in two slightly different models. Each unit had a gimbal assembly for attachment to the vehicle, but the inboard engines,  not required for thrust vector control, were immobilized by struts which held them rigidly in place. The outboard engines were equipped with gimbal actuators, attached to outriggers on the thrust chamber, that produced the gimbaling action for directional control for the vehicle. Basically identical, the inboard and outboard engines possessed an additional physical difference that necessitated a different label for each. The exhaust system varied for the outboard and inboard engines, although both types mounted a turbine exhaust hood, a turbine exhaust duct, and a heat exchanger (with a coil system to convert liquid oxygen to the gaseous oxygen required to pressure the oxygen tanks). The H-1C engine, the fixed inboard unit, had a curved exhaust duct to carry the turbine exhaust gases, and the H-1D engine, the gimbaled outboard unit, mounted a unit known as an aspirator. The inboard engines simply ducted the turbine exhaust overboard. The outboard engine exhaust was ducted into collectors, or aspirators, located at the exit plane of the nozzle. For the H-1D aspirator, designers chose a welded Hastelloy C shell assembly, mounted on the outside of the thrust chamber and extending beyond the thrust chamber exit plane. The aspirator prevented the fuel-rich exhaust gases of the gas generator from recirculating into the missile boat tail during flight. Instead, the gases merged into the engine exhaust plume. The H-1 engine statistics are shown at the top; the sketch above shows the drive for simplification of the H-1 engine from its parent S-3D. Below, left, is the H-1 injector plate and at right is the H-1 liquid oxygen dome bolted in position above the injector. ....combustion instability (or combustion oscillation, at he called it), cracks in the liquid oxygen dome, thrust chamber tube splitting, and problems with the pump gears and bearings. Other difficulties made their appearance, and each required a different kind of troubleshooting to solve the case. At frequent intervals, MSFC and contractor personnel met together to discuss such problems and to consider solutions. At one such meeting, on 1 December 1966, the debate turned to three recently developed problems and included continuing consideration on a report about miscreant materials used in the manufacture of turbine blades. Convening in the conference room of the Industrial Operations Division of MSFC, the participants included technical personnel and management representatives from MSFC, Chrysler (the stage contractor), and Rocketdyne (the engine contractor). Chrysler and Rocketdyne led off the session, with commentary about the discovery of a dozen chunks of Teflon material behind the injector plate of No. 4 engine on the S-IB-7 stage. Workers at Chrysler (who had first discovered the problem) gathered up the 12 shards of Teflon and pieced them together into a flat shape about 5 centimeters square, with some nondescript markings. Representatives from Rocketdyne's Neosho facility, where H-1 manufacturing was concentrated, went to work to discover the origin of the intruding flotsam. While this analysis progressed, related data hinted at similar anomalies in other engines of vehicle S-IB-7. The Rocketdyne spokesman presented data on engine No. 4 that revealed differences in its performance during recent static testing as compared with previous testing-no doubt because of the Teflon pieces obstructing the propellant flow. Rocketdyne was now concerned about two more engines. The No. 8 engine had performance data that paralleled No. 4 in some respects, suggesting a second Teflon interference problem, originating from one of the liquid-oxygen tanks. Moreover, the plumbing sequence in S-IB-7 caused the conferees to suspect that loose pieces of Teflon, originating from a particular liquid-oxygen tank, could also be lodged in the No. 5 engine system as well. The conference group agreed that engines No. 5 and No. 8 posed potential dangers and should be detached and opened up for thorough inspection, despite the impact on launch schedules. Luckily, soon after the conference, Solar Division of the International Harvester Company, an H-1 subcontractor for valve components and other fittings, found the source of the Teflon pieces. During some of  its welding operations, Solar used Teflon buffers to protect the weld piece from abrasions caused by clamps. In fabrication and welding of flexible joints in the liquid-oxygen line, Solar surmised, one of the Teflon buffers could have slipped inside the line. They presented a sample of the buffer, which had the tame general markings, size, and shape as the original culprit. With the source of the problem localized, MSFC and contractor officials agreed to call off the plans to inspect the other engines, and the case of the Teflon intrusion was closed, although some stricter fabrication and handling procedures went into effect. The final problem taken up by the December 1966 meeting-the turbine blades-involved the inadvertent substitution of the wrong material during manufacture. During a "hot test" (actually firing the propellants) on a Saturn IB first stage, one of the H-1 engines experienced failure of turbine blades. After the engines were removed and dismantled, the defective blades were found to have been cast from 316 stainless steel rather than the Stellite 21 material specified in the production orders. An error at Haynes Stellite (a division of Union Carbide) created the mix-up. Although the quality control procedures employed x-ray analysis of each blade for flaws, penetration of welds, and differences in materials in a production batch, the x-ray check could not catch this particular mistake if all the blades were of the wrong material. Revelation of the error came late in 1966, when the Haynes Stellite plant in Kokomo, Indiana, was in the grip of a strike. The strike, of course, made communication between MSFC and Haynes Stellite personnel more difficult. Concern about the substandard turbine blades extended beyond NASA-the slip probably extended to blades in engines supplied for Thor and Atlas missiles. The turbine blade imbroglio not only compromised the Apollo-Saturn program, it shadowed the capabilities of the national defense as well. The development of the H-1 represented a case study of predictable engine problem phases, as outlined by MSFC engine specialist Leonard Bostwick. True to form, the larger F-1 experienced similar growing pains. If these travails seemed more acute, they reflected the size of a much more substantial engine. At left is shown a 1963 test firing of an H-1 engine on a Rocketdyne test stand. At right are H-1 engines in Rocketdyne's assembly line at Canoga Park, California. Engineers quickly sketched out the dimensions and general configuration of the big new propulsion system, drawing on their prior experience under the aegis of the Air Force and the results of the early "hot" test of preliminary components. At Edwards Air Force Base, where much of the early F-1 research had been accomplished, Rocketdyne unveiled the first full-scale F-1 mock-up on Armed Forces Day, 1960. Edwards continued as the center for full-scale engine testing. Basic research, development, and manufacturing took place at Rocketdyne facilities in Canoga Park, California, and many component tests were conducted at the company's  Santa Susana Field Laboratory in the mountains nearby. The company lost little time in getting started on real engine hardware. Full-scale tests on the engine's gas generator began in March 1960, and testing of the prototype turbopomp got under way in November of the same year. Given the size and cost of the F-1 program, component testing represented an important practice-a technique that Rocketdyne continued to refine during the development phase of the total propulsion system. This "piecemeal" approach avoided the costs and complexities, as well at months of delay, that would have resulted from using the total engine system for the initial tests. Company personnel also conducted "component extended limits" testing, which called for the hardware under test to be pushed beyond its normal performance specifications to establish comprehensive guidelines of reliability and confidence. This concept proved to be so successful that Rocketdyne applied the same extended limits test concept to other engine test programs in progress. The ability to put components like the gas generator and turbopump through test runs so quickly brought compliments from NASA's engine program managers at MSFC, who appreciated the problems connected with testing such an oversized propulsion system. 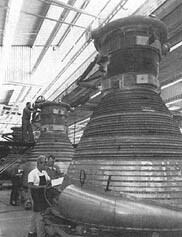 Rocketdyne personnel pulled off another coup; they not only conducted tests on many full-scale components within a year of the initial contract, but on 6 April 1961, only 27 months from start, they went through a test run of a full-sized thrust chamber assembly prototype at Edwards Air Force Base. During the run, the thrust of the prototype chamber peaked at 7 295 000 newtons (1 640 000 pounds) of thrust-an unprecedented achievement for liquid-propellant rocket engines. Even with the advantages of the Air Force research effort, this was a noteworthy record of accomplishment.27 But a good many predicaments-and sophisticated test work-were to come. The scale of the engine always seemed to threaten the goal of keeping the system old-fashioned" rather than creating a daring new concept. For example, NASA continually emphasized engine reliability because of its intended use for manned missions. In this context, NASA limited the options for fuel and oxidizers for the F-1 to proven types- liquid oxygen and RP-1-and stressed the greatest simplicity in overall engine design. This approach in turn dictated the incorporation of proven component designs wherever possible, combined with advanced metallurgy for added reliability. Once designers got into advanced metallurgy, they got into innovation. Coupled with the factors of size and operating requirements of the F-1, there ensued a number of technological advances and innovations in fabrication techniques. At nearly every step of the way, the unusually large engine exhibited growing pains, and each component required special design attention in one form or another. In some cases, these problems were unanticipated; but even when designers expected a difficult development period, the solutions did not come easily. Such was the case with the F-1 injector. The injector sprayed fuel and oxygen into the thrust chamber, introducing it in a pattern calculated to produce the most efficient combustion. To the casual observer, the final production model looked simple enough. The face of the injector, or the combustion side, contained the injection orifice pattern, determined by alternating fuel rings and oxidizer rings, both made from copper. Across the face of the injector, designers installed radial and circumferential copper baffles. These baffles extended downward and divided the injector face into a series of compartments. Along with a separate fuel igniter system, the Injector and baffles were housed in a stainless steel body. In operation, the liquid oxygen dome, or LOX dome, located atop the thrust chamber assembly, channeled oxidizer directly into the injector. Fuel injection followed a somewhat more indirect route, entering the injector from the thrust chamber's fuel inlet manifold. As a means of ensuring the engine start and operating pressure, part of the fuel flowed directly into the thrust chamber, but the remainder was channeled by alternating tubes down the length of the regeneratively cooled thrust chamber, then back up again through the remaining tubes. The fuel entered a fuel collector manifold, consisting of 32 spokes leading to the injector. Finally, the fuel squirted through 3 700 orifices into the combustion chamber to mix with the oxidizer, which entered through 2 600 other orifices in the injector face. Engine start sequence for the S-1C stage. ....the outset, it might have seemed logical to scale up designs successfully developed for smaller engines. However, development of a stable injector for the 1 780 000-newton (400 000-pound) thrust E-1 engine required 18 months, and it seemed more than likely that the 4.5-million-newton (1.5-million-pound) F-1 would require something more than just a "bigger and better" design concept. Rocketdyne's ability to run injector and thrust chamber tests with full-scale hardware in March 1959, only two months from the date of the original contract, derived from its earlier Air Force activities. Some experimental hardware was already on hand, and Rocketdyne also had a usable test stand left over from prior experiments. The first firings were made with components several steps removed from what could be expected as production models. Because the injector paced so much of the overall design and because designers and engineers wanted to start as  soon as possible, the thrust chamber tests used rough, heavy-duty hardware; it was cheap, and it was easy to work with. Investigation began with a critical review of all prior operational injector work and current experimental studies to develop a promising avenue of design for the new component. Advanced theories were needed to understand the operation of an injector at much higher densities and higher chamber pressures than ever attempted. As a result of this preliminary theoretical work, the F-1 injector evolved as a construction of copper rings. This promised the necessary structural rigidity, resistance to localized hot spots, and overheating at the injector face. Significant theoretical work was accomplished by two Princeton researchers, David Harrje and Luigi Crocco, along with Richard Priem of the Lewis Research Center. When Crocco was in Europe on sabbatical during the academic year 1963-1964, he maintained correspondence with MSFC; NASA Headquarters even approved von Braun's request to send Rocketdyne and Marshall representatives to talk with Crocco in  Rome.40 To investigate the phenomenon of unstable combustion, engineers and researchers employed a wide range of instrumented apparatus and other aids. Among other paraphernalia, investigators introduced high-speed instrumentation to diagnose combustion in the thrust chamber and to evaluate modifications to the original designs. The exacting attention to details led to apparently minor changes that actually proved to be of major significance. After careful calculations of the effect, enlarging the diameters of the fuel injection orifices was later judged one of the most important single contributions to improved stability. Other careful changes included readjustment of the angles at which the fuel and oxidizer impinged.41 Several techniques of rather dramatic nature were also applied in the instability research. For the layman, the most bizarre aspect of F-1 testing (like the H-1) involved the use of small bombs to upset the thrust exhaust pattern to measure the engine's ability to recover from the disturbance. By varying the size of the bombs, test engineers could create instability of different intensities and evaluate the ability of the engine to restore stable conditions. Above, a cutaway drawing of the liquid oxygen dome and the injector plate of the F-1 engine; below, a cutaway drawing of the Mark 10 turbopump for the F-1 engine. ....convenient feature required a special heater to keep the ball bearings from freezing up when the pump was chilled by liquid oxygen prior to engine start. The oxidizer pump, rated at 102 230 liters (24 811 gallons) per minute, supplied oxidizer to the thrust chamber as well as to the gas generator. Oxygen entered the pump through an inlet connected to the oxidizer tank by a duct, and the inlet had an inducer mounted in it to increase the pressure of the oxidizer before it reached an impeller. This sequence prevented cavitation in the liquid oxygen stream. The impeller brought the oxygen to the correct pressure, then discharged it through appropriate routes to the thrust chamber and gas generator. With a rated capacity of 57 392 liters (15 741 gallons) per minute, the fuel pump supplied the thrust chamber and gas generator in the same manner as the oxidizer pump. The fuel pump system also employed an inducer section to prevent cavitation before the fuel reached the impeller. The turbopump was a good example of the emphasis on simplicity and reliability in design philosophy. "The primary consideration in the selection of the turbopump design," MSFC managers emphasized, "was to attain reliability by using a minimum number of parts and proven  design concepts." Engineers were anxious to have a turbopump capable of operating at low inlet pressures, both to simplify design requirements and to have low pressure in the propellant tankage. The packaging concept of the F-1 influenced the design of the turbopump system. The main objectives in the engine configuration included designing components to be as small as possible and keeping machinery as accessible as possible. In general, the configuration of the engine package followed the pattern of the Atlas sustainer engine (the S-4), Rocketdyne's first large liquid-propellant gimbaled engine with the turbopump mounted directly on the thrust chamber. Designers located all other associated equipment on the turbopump, thrust chamber, or somewhere in between. The attraction of this approach, as in the H-1, lay in the ability to avoid flexing the high-pressure propellant ducts in concert with the gimbaling engines during a launch. At a rate of three metric tons per second (one metric ton of RP-1 fuel and two metric tons of liquid oxygen), the F-1 was designed to burn its propellants at approximately 79 000 newtons per square centimeter (1 150 pounds per square inch) at the injector face (the high pressure was emphasized as a matter of efficient design), and within the thrust chamber convert this furious activity into a high-temperature, high- velocity gas with a yield of 4.5 million newtons (1.5 million pounds) of thrust. Transforming the thrust chamber's individual tubes into a vessel capable of handling the F-1 pressure and heat required specialized metallurgical research in Rocketdyne laboratories and at MSFC. 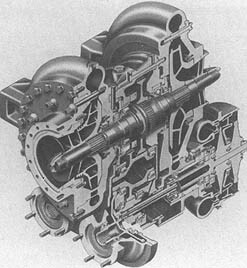 To form the regeneratively cooled engine, the F-1 was fabricated as "a tube bundle surrounded by a heavily jacketed combustion chamber, a series of bands around the nozzle, and two end rings." 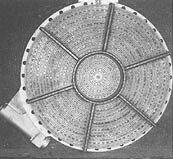 The basic thrust chamber included 178 primary tubes and 356 secondaries, requiring 900 meters of brazed joints between them to keep the combustion gases contained within the thrust chamber. 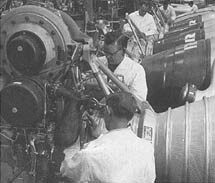 Rocketdyne personnel expended a great deal of effort on the perfection of brazing operations required for the nickel-alloy thrust chamber assembly; it was a major challenge to perfect an alloy and a brazing technique to seal the hundreds of tubes together in a bond that would withstand high temperatures and pressures. The joints carried some of the stresses created by the expanding combustion gases, but the jacket and reinforcement bands around the tube bundle carried the primary load. 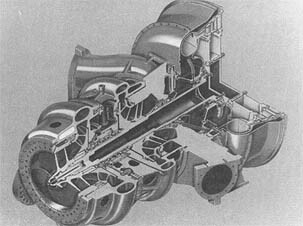 This basic F-1 design reflected the features of other regeneratively cooled engines with tubular walls, such as the Atlas and H-1 engines. The greatly increased operational factors of the F-1 required more sophisticated fabrication methods, which led the company, finally, into the design and construction of the largest brazing furnace of its type in the world. With the furnace activated in 1965, furnace brazing for F-1 production proceeded in several carefully regulated sequences. 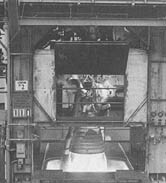 After preliminary brazing operations to unite the thrust chamber tubes and other components, the scene was set for the final furnace brazing cycles to create a properly sealed thrust chamber. Inside a "clean-room" area, workers assembled the complete thrust chamber, using a special fixture devised by Rocketdyne to ensure proper alignment of the tube bundle, jacket, and end rings. In addition to the 900 meters of tube-to-tube alloy joints to be sealed inside and outside, the exterior required some 7 000 tube-to-band joints to be brazed. The brazing alloy, in a powder form, was applied by workers using hand-held spray guns, an application technique also especially developed by Rocketdyne. Above, a cutaway drawing of the F-1 thrust chamber; right, the hugh furnace at Rocketdyne in which the tricky brazing operation was performed on F-1 engine thrust chambers at 1260°C. ....disposal of the turbine exhaust gases into the thrust chamber by way of the nozzle extension, Rocketdyne designers realized the advantages of a neat, comparatively lightweight system. There was no need for extra attachments such as a turbine exhaust duct, and the extension favorably increased the expansion ratio. Designed with simple bolted attachments, the extension could be conveniently removed for shipping and handling of engines and stage. The simplicity of the design allowed the engine to be easily test-fired following reattachment of the nozzle skirt at the test site. To help keep the S-IC propellant tanks under pressure, the engine contractor supplied elements of the propellant tank pressurization system. The key to the system was the heat exchanger, which heated gaseous oxygen and helium to pressurize the oxidizer tank and fuel tank, respectively. Using the vehicle's own oxidizer as part of the propellant tank pressurization system illustrated harmoniously integrated design of many of the rocket systems and subsystems. Another good example involved the use of the fuel as the fluid medium in the hydraulic control system. The hydraulic design itself constituted a notable design advancement for an engine the size of the F-1. The system cut out many sets of  previously required pneumatic controls and electrical components and automatically increased reliability. Once the fuel used as the hydraulic fluid had performed its programmed chores in engine components, a myriad of tubing routed it back to the turbopump fuel inlet fur combustion in the thrust chamber. The frustrations of perfecting an engine the size of the F-1 ran the gamut from internal hardware to external accessories. The high operating temperatures of the engine called for varied insulation at many points, and the super-hot blasts from the clustered engines created the need for special insulation to protect the engines from their own exhaust. During the vehicle's ascent, the plumes from the five F-1 engines expanded with decreasing ambient pressure until they become one searing, gargantuan sheet of flame, and a backlash stream of hot gases played over all the exterior surfaces of the engines. For this reason, designers had to protect the engines from thermal attack during the flight, as well as consider the high heat radiation encountered as the engines built up to mainstage thrust levels at liftoff. Thus, the F-1 engine acquired its distinctive external insulation "cocoon," molded into segments and attached to the engine with brackets. Despite its deceptively simple appearance, the development of this insulation cocoon also experienced its share of problems in attachment and weight. To accelerate the test schedules for production models of the F-1, executives at MSFC decided to test the engines in Huntsville and ordered appropriate modifications to the west side of MSFC's static test tower. Thus, while the engine test stands at Edwards supported ongoing research and development, Marshall personnel checked out the first batch of production engines during 1963, sending the F-1's thundering roar through the Tennessee River valley. The tempo of F-1 engine tests picked up during 1964, as MSFC personnel ran numerous static tests in Huntsville, and Rocketdyne supervised continuing work at Edwards Air Force Base. In October, the new dual-position test stand at Edwards became operational. The Director of MSFC, Wernher von Braun, flew out to California for the ceremonies, where he accepted the newly activated stand on behalf of NASA and then assigned operational responsibility to Rocketdyne. With all test stands utilized at full capacity, the Flight Rating Tests of the F-1 propulsion system soon concluded, and flight qualification was verified by NASA spokesman by the last month of the year. The concurrent lines of development of stages and engines now began to converge in Huntsville where a "live" test stage (the S-IC-T), with a full complement of five F-1 engines, awaited its first dramatic test firing. The use of MSFC facilities on 16 April 1965 put this phase of testing two months ahead of schedule, and the 6.5-second ignition of the S-IC-T stage generated 33 000 000 newtons (7 500 000 pounds) of thrust, more collective rocket power than ever before achieved. The F-1 test stand in the Mohave Desert towered 76 meters (note man at base). The production line for F-1 engine thrust chambers at Rocketdyne. .....contributed to their success. When the Saturn V took the central role in the late 1960s and early 1970s, the remaining nine Saturn S-IB first stages, along with their 72 H-1 engines, went into storage. When they were earmarked for use in the Skylab program, many people wondered if such old equipment would still be reliable. In the spring of 1971, nine years after the delivery of the last production unit, technicians pulled one of the H-1 engines out of hibernation, to test the "certified lifetime" of seals, gaskets, and other components. The test was important, not only for the immediate purpose of Skylab, but to know how other liquid-fueled rocket engines stored away for future missions were faring. 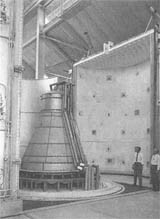 After an extensive pretest examination, the H-1 was installed in a test stand at MSFC. Engineers put the engine through its paces: three separate starts, followed by a full-duration run of 140 seconds. The engine performed as well as at its qualification test firing, 108 months earlier. MSFC personnel tore the engine down after firing to see if they could discover any weaknesses, but all the seals and other critical parts were still in good shape and fully serviceable. Marshall officials sent the engine back into storage, satisfied that they could all be called upon to serve any time within yet another 8-10 years. A year later, during June 1972, Rocketdyne personnel did similar tests on an F-1 engine that had been delivered to MSFC in 1965, tested in 1966, and put into storage. The engine was run through two extended duration firings at Edwards Air Force Base, then subjected to rigorous inspection and analysis. The engine showed no abnormalities.56 Faith in the engines' lifetime was justified by the successful launch of the Orbital  Workshop aboard a two-stage Saturn V (S-IC first stage and S-II second stage), followed by the three successful manned launches of the Saturn IB in support of the Skylab program in 1973, followed by another Saturn IB in the Apollo-Soyuz Test Project in 1975 (see chapter 13). F-1 fundamentally different. The H-1 experienced R&D Problems as it was uprated in thrust. Taking proven H-1 components, such as the injector, and scaling them up to F-1 requirements turned out to be not only difficult but basically impossible. The job necessitated a fresh approach. Reworking the engine and the injector to cope with combustion instability entailed an R&D effort of notable scope, embracing scientific and technical specialists from MSFC and other NASA centers, the contractor, other government agencies, private industry, and universities. In addition to other F-1 complications, the nature of the facilities for testing and manufacturing (furnace brazing, for example) of the F-1 also differentiated it from the smaller H-1. The extent to which cryogenic oxidizers and fuels of the RP-1 type had been used in earlier engines made the H-1 and F-1 conventional propulsion systems. Other Saturn cryogenic engines used a different, more potent fuel: liquid hydrogen. As the first large rocket engines to use a cyrogenic fuel, the RL-10 and J-2 were unconventional. * In a note to the author (8 July 1976), John Sloop, a senior NASA propulsion engineer, noted that combustion instability, like engine knock, has long been studied, and engineers had learned to deal with it. But neither was yet fully comprehended.